Product #21951 | SKU VZ-ROCK-J600 | 0.0 (no ratings yet) Thanks for your rating! The VariZoom VZROCK-J600 JVC Zoom/Focus/Iris Control is specifically designed for the JVC GY-HM600 and GY-HM650 cameras. The zoom rocker has a wide range of motion for a fine degree of speed control. 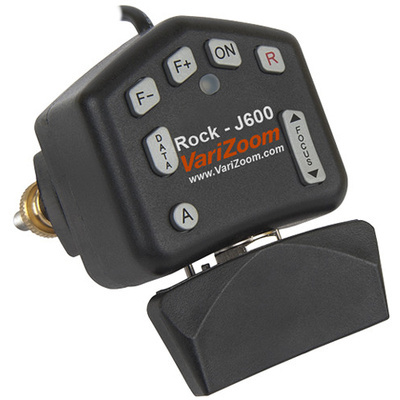 The VZROCK-J600 features a dedicated rocker-style focus button, a low-profile record/pause button, iris control buttons, and an LED for indicating recording status. Additional features include buttons for selecting auto or manual focus and iris modes and a button for turning on-screen displays on and off. The farther you press the zoom rocker switch to the right the faster it will zoom in (telephoto), and the farther you press it to the left the faster it will zoom out (wide). You can also control the focus of your lens manually using the controller. You must first set the camera to "Manual Focus" mode. Once you are in Manual Focus mode, you can use the switch on the controller marked "FOCUS" to precisely adjust the focal plane. Pressing the up-arrow will move the focal plane farther away while pressing the down-arrow will bring the focal plane closer. The available focal range will be somewhat reduced at telephoto. The small button marked with a red "R" is the record start/stop button. The F- and F+ buttons control the iris setting. The F- button will lower the f-stop (open iris) while the F+ button will raise the f-stop (close iris) between 1.8 and 8.0 (range will differ at telephoto). The LED indicator light will turn on and off to indicate recording status. The "On" button toggles between auto and manual iris mode, and the "A" button toggles between auto and manual focus mode. The Data button toggles the on-screen display (record time, settings, etc.) on and off.